Are self-driving cars really the future? Is the steering wheel about to become an endangered species? Car and driver. It's the classic man-and-machine symbiosis. But are cars about to become the dominant partner, at least as far as who's in control? Before you dismiss the concept of a self-driving car as science-fiction fancy, know this. You can already buy cars capable of doing a surprising amount of automated locomotion. And there are fully robotic prototypes on public roads, too. The real questions, then, are whether it's a good idea and if so when will it happen? The answer to the former is almost definitely affirmative for most people, most of the time. Naturally, there will be a small cadre of driving enthusiasts who hate the idea. And they're quite right to do so. After all, they're driving enthusiasts, not passengering enthusiasts. But for most people, driving is a means to an end of getting somewhere. More to the point, given the amount of time wasted courtesy of the developed world's increasingly congested roads, the ability to do something useful when you're stuck in the car could have significant economic consequences. So, the test for self-driving cars is really about technical feasibility and perhaps, most critically of all, safety. But let's start with where we are today. Cars with significant self-driving capability are already available today. Several brands currently offer what's known as intelligent or autonomous cruise control, for instance. The drill here is the ability to not only cruise at a fixed speed, but also to detect surrounding traffic using laser- or radar-based sensors and adjust speed, including brake application. In other words, all the driver has to do is steer. The most advanced such systems, for example the Mercedes Distronic Plus, are able to bring a car to a complete halt. Another example is assisted parking. Several brands offer cars with the ability to take over the steering duty when it comes to parallel parking. 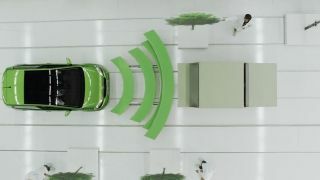 Some, including BMW's Park Assist, even use sensors to automatically identify suitable spaces as you drive along. If those are examples of what you might call convenience-based self-driving, there are plenty of safety-orientated technologies, too. Auto braking, based on forward-firing radar and laser sensors is almost mainstream, now. Skoda's Citigo microcar, for instance, has City Safety, a feature that can automatically hit the brakes if a likely collision is detected. Some systems are also tuned to spot pedestrians. Another example is lane-departure control. Not only can some cars warn drivers when they drift out of a lane due to lack of concentration, they can also provide a little corrective steering lock to help get things back on course. Put it all together and you have cars with a surprising amount of autonomy. But there are problems. BMW, for instance, reckons it could have a fully-automated parking system on sale within a couple of years. This would be a system that wouldn't even require the driver to be on board. You simply step out, hit the park button on the key fob and let the car do it's thing. The advantage here beyond the act of automated parking is not having to squeeze in and out of the car in tight spaces. Problem is, in most countries, legislation does not allow for cars to operate without on-board human supervision. That will have to change before such systems can be made available. That applies even more so to cars able to ply highways and byways fully automated, but we'll get back to that subject in a moment. While we're in this transitional phase of semi-automated cars, there are also serious safety concerns. As more and more of the work load is taken away from the driver, keeping the driver focused on the task at hand becomes more difficult.